Most of you are probably familiar with the Get Info window, which you activate by selecting one or more items in the Finder and then pressing Command-I (or choosing File -> Get Info). This window is useful for things such as checking permissions, file sizes, file counts for items in folders, changing the Open With application, and much more. But even if you do know about the Get Info window, you may not be aware of the fact that (as of OS X 10.4 ) that it actually has three variants. Which one to use depends on what type of information you’re looking for, and how many items you have selected. This is the traditional information window that’s existed in various versions of the Mac OS for many, many years. The Get Info window is a “static” window—once opened for a given Finder selection, the contents of the Get Info window won’t change. In versions of OS X prior to 10.4, if you selected multiple items in the Finder and hit Get Info, you’d get a nice summary window showing the size of the items in the Finder selection. In 10.4, however, that behavior has changed, with (of course) an exception. 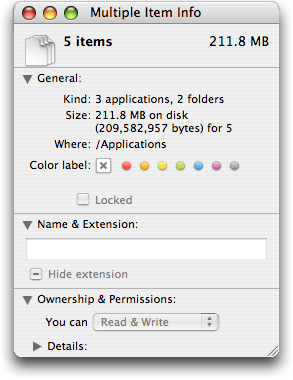 If you select 10 or fewer items in the Finder and hit Command-I, you’ll get (up to) 10 distinct Get Info windows. This change is a welcome one, for it makes comparing more than one file or folder quite simple. Like the Get Info window, the Summary Info window is static—its contents will always reflect the Finder’s selection at the time the window was activated. Changing the selection in the Finder won’t change the contents of the Summary Info window. While this makes it great for comparing different Finder selections, it’s not so good for viewing the information on many different files, especially if you have more than 10 such files to examine (as you’d then get the Summary Info window). To make that process easier, you need a dynamic information window, one whose content changes as you change the selection in the Finder. In other words, you need the Inspector window. The Inspector window is always a summary window—regardless of how many or few items you have selected, you will always see only one window representing the summary of that selection. (Obviously, with one item selected, you see only that item’s info.) To activate hit, hold down Option and choose File -> Show Inspector, or use the Command-Option-I keyboard shortcut. The main benefit of the Inspector window is that it’s dynamic—as you select new items in the Finder, the contents of the Inspector window change to reflect the current selection. If you want to check a lot of files in a hurry, but don’t necessarily need to compare them to one another, the Inspector is a fast way to do just that. Some people have even used the Inspector as a simple media player, leaving it open and then playing movies and audio files directly in the Inspector. This saves a trip to QuickTime or iTunes, and if you’re just reviewing things, the small movie size won’t be an issue. So there you have it; more than you might ever have wanted to know about the Get Info window and its close relatives, the Summary Info and Inspector windows.